I wanted to share Stains on Panes with my readers this month. Scott arrived to clean my windows - he was in a company sweatshirt and showed me is ID before we even got started which I thought was a great way to start. It didn't take long to realise that Scott is extremely passionate and knowledgeable about what he does. 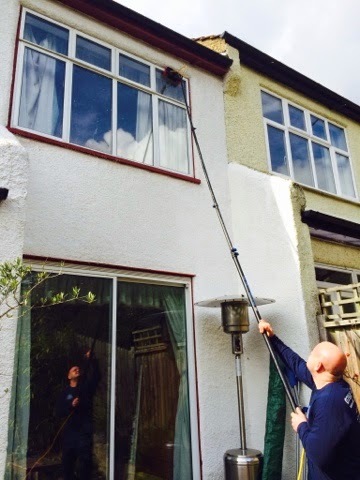 For my house - a 3 bed semi, Scott used his Reach and Wash pole system - the poles can be adjusted to suit different heights and the brush heads had been adapted by Scott to maximise there performance. Scott has a specially adapted backpack to use with the Reach and Wash poles allowing him to easily clean properties with restricted access. 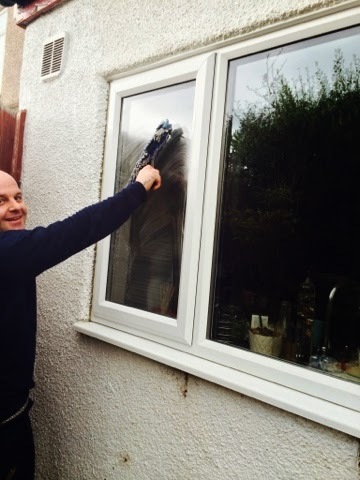 Scott uses a method which involves firstly a scrub, then rinse followed by cleaning both the frames and sills. Scott has a water tank inside his van which has a special resin filter to ensure that the water is pure - Scott used a TDS meter to show me the quality (impurities) of my own water from my garden tap - at a surprising 306 ppm, whilst Scott's own water from his tank showed only 5ppm meaning the purer water is less likely to leave chalk residue or smears that you might get from using my garden tap water. 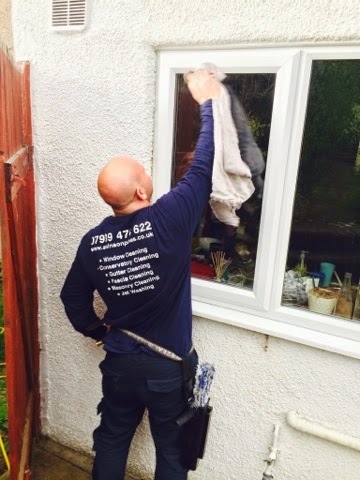 Besides the Reach and Wash method, Scott can also carry out a traditional wash too, where he will still take the time to clean the frames and sills. It started to rain whilst Scott was still cleaning but he wasn't phased by it and explained that the rain didn't affect the quality of the clean. My front windows were lovely and clean whilst my rear 2 bedrooms and patio window (a much older style of window) are a little streaky - Scott explained that at some point in the past, someone had used the wrong kind of paint on the frames which started to come off during the wash - Scott has reassured me that future cleans will solve the problem. Scott recommended a clean every 8 weeks for my house - a 3 bed semi - at a cost of £20. 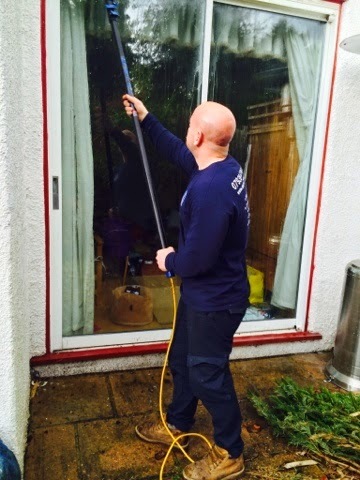 Scott also carries out other maintenance jobs such as gutter cleaning and is fully insured in addition to being a member of the Federation of Window Cleaners. One of Scott's passions is improving and adapting the equipment to perform better or coming up with his own ideas and inventions - he's currently working on a portable trolly system as a back up plan should he ever find his van out of action! Stains on Panes clean both residential and commercial properties in and around Bromley - Kent and London regions. * Disclaimer - I received a window clean for the sole purpose of writing a review.